In the main house there is under floor heating in living room, utility room and all bathrooms. In the annex one bedroom and both the bathrooms have under floor heating. Aircon for cooling and heating in both the main house and in the annex. 7 in total! ACTIVITIES: For children and family: - Aqua Parks at Torre del Mar - Go-Karting at Torre del Mar - The Caves of Nerja - Horse riding & pony trekking near Competa. - Small shops, restaurants, pubs, café's, galeries, church, market. Sightseeing: - Competa and many nearby Moorish white villages are interesting to explore. - Frigiliana, near Nerja is worth a visit. - El Acebuchal great little village to have lunch ! interesting history - Wineries: Bodegas Almijara and Bodegas Bentomiz - Malaga with its great castle ( and shopping opportunities ) - Granada with the Alhambra Palace are one and a half hour's drive away. - Gibraltar is 2 hour’s drive away. Sport: -There are two 18 holes golf courses within short driving distance. - Skiing in the Sierra Nevada is 1 ½ hours away. - Tennis at the hotel in Competa - Fishing Nature: - Walks in the Sierra Tejeda and Almijara Natural parks - An interesting 4WD trip to the nature and mountains provided by a shop in Competa. We stayed at villa Orian in August as two families, the children ranging from 14-21, our eldest son decided to join us at late notice for a week. There was 10 of us altogether and this villa accommodates this number comfortably, with everyone having plenty of room. The pool was where we spent most of our time when we were at the villa, with beautiful views of the surrounding countryside. As well as the beautiful views, the pool is a fantastic size and was great for doing lengths to keep fit and work off all the excess food and drink consumed! The pool is deep so if you had young children it would be advisable to keep armbands on them, there is a gate to the pool as mentioned, so it is safe. The veranda, where a good selection of tables and chairs, a couple of sun loungers, football table and a very large table and chairs for meals are located, is absolutely beautiful. Four of our children stayed in the annex together, which they loved and it gave them their own space. On the same level as the annex is a table tennis table and BBQ, plus another table and chairs, many happy hours and lots of laughs were spent having table tennis and football table tournaments, and kept everyone amused. The villa had every facility we needed, the two big fridgefreezers were a Godsend with a large group of people as you are a good 15-20 minutes drive away from Competa which is the closest town to buy provisions. We used the beaches at Nerja and Torrax, Torrax had banana boating and other watersports and we loved the town of Nerja, with its good selection of bars and restaurants. The only downside was the drive back at the end of the evening, as previously mentioned by another reviewer, the drive through the mountains is... "Not for the fainthearted", especially in the dark! Do not let this put you off though as the villa is truly spectacular and well worth the drive, we had a fantastic relaxing holiday which was just what we all needed. Henk and Rene were in contact with us from the moment we booked our holiday until the present day, nothing was too much trouble. Thank you very much to you both for letting us stay in your truly beautiful property, and I hope we can return one day to see all the changes to the property that we know you are intending to make. There were ten of us staying in the main house and annexe. We had everything we needed for a comfortable stay. The pool was wonderfully warm and safely gated. We had one energetic two year old with us and I do not think the house is really suitable for a child between one and four. We managed by moving some furniture around and never taking our eyes off her! However we loved our time there and would definitely recommend it to others and would go again. The drive to Competa takes at least 15 minutes along a very narrow road but once you get used to the bends and sheer drops it is fine. It is not for the faint-hearted! The wild life around was wonderful - foxes to watch, snakes, bats, large hawks, beautiful birds and birdsong. The garden was full of lovely plants, flowers and fruit. Wonderful place to relax!! Huge and magnificent place, almost like a lodge or a villa ... with a superb view and enough place for everybody!! Also a good spot to hike! The next little city Competa is very nice and a good place!! We looked at photographs of Casa Orion so many time before we flew, but nothing prepared us for how beautiful the property is. The photos cannot do it justice. 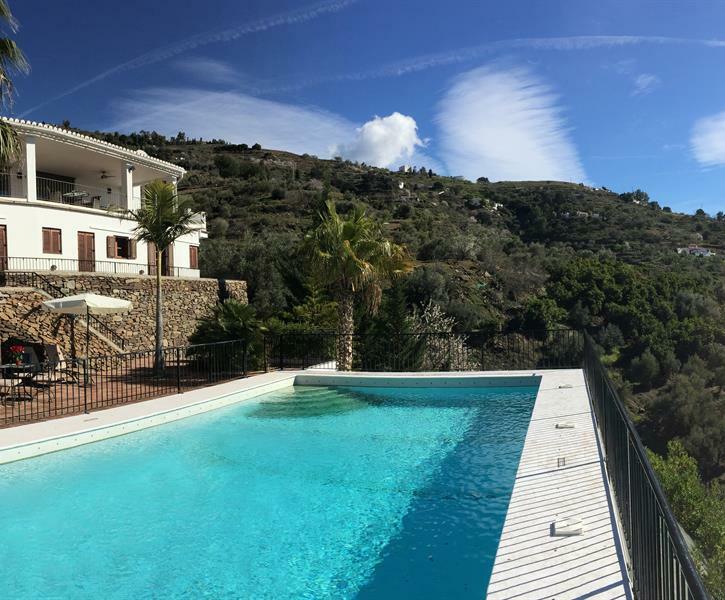 The bird life right around the villa is pretty spectacular (we went in late August) and the local short-toed eagle turned up every day, flocks of up to 100 bee-eaters flying overhead, alpine swift, honey buzzard, black wheatear and nightingale all seen from the pool side. The lounge and kitchen area were particularly beautiful, and the views down the valley just breathtaking.